Adolf Hitler declaring war on America, December 11, 1941. On December 11, 1941, several days after the Japanese attack on Pearl Harbor and the United States declaration of war against the Japanese Empire, Nazi Germany declared war on the United States, in response to what was claimed to be a series of provocations by the United States government when the US was formally neutral during World War II. 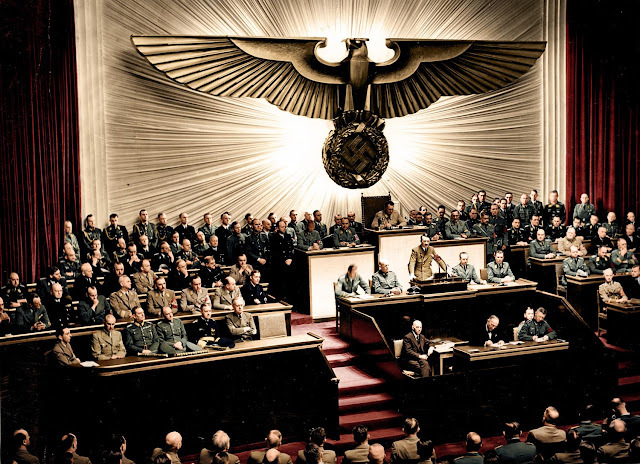 The decision to declare war was made almost entirely by Adolf Hitler, without consultation. Hitler had received no advance notice from the Japanese about the attack on Pearl Harbor. Although he and his Foreign Minister Ribbentrop had verbally indicated a willingness to join Japan in war against America however it broke out, Hitler had absolutely no formal treaty obligation to declare war on the United States. Such a treaty had in fact been drafted and circulated in the weeks prior to Pearl Harbor, but it remained unsigned. Hitler assumed that war with the United States was inevitable. He was completely right. The US was neutral in name only at that point and was going to join the war on Britain’s side sooner or later. So Hitler decided that the best move would be to declare war on the USA in December 1941 both to show solidarity with the Japanese/strengthen the ties of the Axis and to hit the US right after their Pacific fleet had been dealt a massive (though crucially not a crippling) blow. What Hitler got wrong (which was the exact same thing that the Japanese high command got wrong) was he completely underestimated the production power of the United States as well as the country’s willingness to shift the vast majority of that production over to wartime needs. There were multiple provocations by Roosevelt to get the war he wanted all along. The only thing stopping him was the American people. More than one fraudulent provocation originated from Washington and Roosevelt interfered with a Hitler offer of peace to Britain, when Britain may have accepted it in July 1940. Roosevelt further provoked Germany by reporting German U-boat positions to the British, all while publicly claiming neutrality. When Hitler refused to be triggered into a war against the U.S., Roosevelt went to plan B - entice Japan into attacking. A plan that led the U.S. into WW2. So tell me again who the real warmongers were? FDR engineered the attack on Pearl Harbor much more than the Japanese. This is an excellent read for anyone who is interested in history or politics.The book is well written and flows easily. I felt it was well researched and was a book that filled a void created by the secrets and deceptions imposed on our nation during the entirety of WW11.When the Administration adopted the "Ends justify the means" policy laced with lies and deception, thousands upon thousands of lives were lost in the Pacific, and many of our good military officer's lives were changed forever,their reputations tarnished beyond repair.Perhaps this book brought some measure of closure to an entire nation. It is a shame it was so long in coming.